Every year, most of us spend a huge chunk of our pay packet on energy for our home. Whether it’s heating, cooling, or powering electrical devices, it makes a big dent. But by taking a little extra time and some small steps, you can decrease your energy use, reduce your bills and, of course, benefit the environment. A simple way to cut your gas bill is by using less heat. While one degree may not seem like a lot, it can save you thousands of dollars through the year. Try putting on a jumper and slippers. You can also get a programmable thermostat or just remember to turn down the heat when you’re not in the house during the day. Cutting your water bill is easy. While it might not seem that high, think of all the energy you’re using to heat the water you use. By cutting water, you’re slashing two bills at once. Here are some quick tips for saving lots of water. * Don’t water your lawn. If the plants and grasses you’re using in your yard are appropriate for the area you live, you should never have to water your lawn. Research native grasses and plants and slowly transition your yard as you can. * Turn off taps. Many of us know to turn off the tap when we’re brushing our teeth, but you can also do this as you shower. It takes a little extra thought, but saves a lot of water. * Collect running water. When you let your water run so it will get warm or cold, collect it. You can use this later to make coffee, water your plants, do your dishes, wash vegetables or brush your teeth. Saving money on your electricity bill is probably the simplest step of all: turn things off! It’s simple and easy and most of us forget to do it several times a day. If something is not in use, turn it on. If you have young children make a game of it so they develop the "turn it off" habit. What’s even better than turning a thing off? Unplugging it. Most appliances use up power even if they’re not on. You can unplug them, or put them on a power strip and turn it off when you’re not using everything. You can’t live without lights and appliances all the time, but you can switch to types that are more energy efficient. Energy star appliances may be an investment in the first place, but you’ll save in the long run. 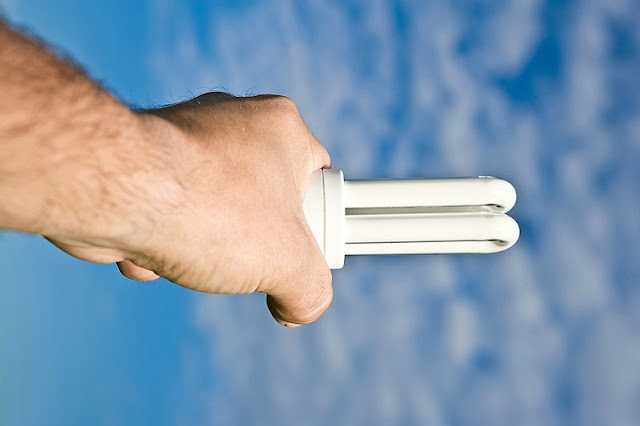 Even if you can’t afford the upgrade now, you can still make a dent in the electric bill by buying compact fluorescent light bulbs. They use less energy and last longer too. A fantastic way to cut your energy is to cut how much you use by using alternative energy sources. It can take some investment of time and money to install solar panels or a device to harness wind, but when you see how much they save you, you’ll be happy you made the change.